When I happened to know about Lakshmi's RCI, Tamil Cuisine...as an interested new food blogger,I made up my mind to contribute to the great event.Mainly because I am married to Tamilnadu and soaked in Tamil Cuisine all the 3 times a day.As a proud daughter inlaw of Tamilnadu,I learnt the Unique recipes and cooking methods of the state.The teachers being my ma inlaw and her mother. Morkuzhambu in Tamil,Moru Curry or Kachiya Moru in Malayalam,Majjiga Pulusu in Telugu,Majjige Huli or Saaru in Kannada,Kadi in Gujrathi, are all close to one another as the members of the same family,like we the food bloggers!. This side dish is the most favourite rice accompaniment of my family and is a Definite Sunday Samayal.So here's the simple and tasty recipe of Morkuzhambu,I learnt from my husband's granma: my entry to RCI Tamil Cuisine. A stalk of curry leaves. 1.Soak and grind the ingredients as mentioned above; keep aside. 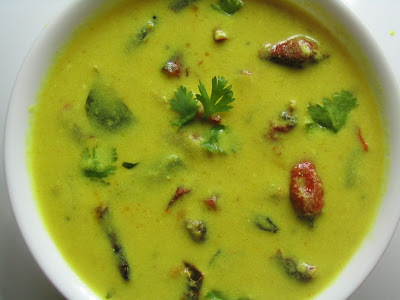 2.Heat oil in a thickbottommed vessel(avoid iron kadai, as it may not tolerate the acidity in yoghurt),splutter mustards and urad dal,fry broken red chillies.Add curry leaves. 3.Immediately add the ground paste to avoid overfrying red chillies and boil carefully for 2 minutes in low flame to avoid any sticking to the bottom.Add turmeric powder.Add a little water if the paste gets too thick. 4.Whip yoghurt lightly to make it to a uniform consistency and add to the boiling paste.Add salt.The curry frothes up in a few minutes. Switch the stove off. (if overboiled the yoghurt gets denaturated into water). 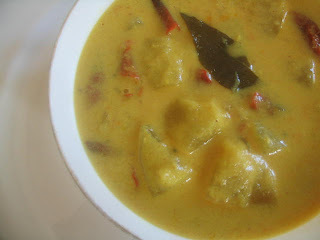 5.The curry should be semi-thick and not too watery in the final stage.Serves well with boiled rice. P.S-The photographed dish is 'Plain Morkuzhambu'.Variations can be made with added vegetables like ladies finger, ash gourd or even 'vada balls'. Variation1) If you prefer adding vegetables,follow the recipe as above.The vegetable of your choice,should be cut a little big,say an inch piece and cook separately.they should not be let wholly cooked in the ground paste or after the addition of yoghurt. Variation 2) If you want to try with vada balls,soak 1/2 cup whole(ball variety) urad dal for an hour and grind to a smooth paste.Add salt.Deep fry in oil as small gooseberry sized balls.Immerse one by one into the hot "morkuzhambu".Let the balls absorb the curry well and turn a little bigger in size.Check consistency & Serve. Beautiful looking Morkolambu B! Love it.Thanks. Wow, as Asha said this is so much simillar to majjige huli. Loved the presentation and I always feel this dish to be very soothing on a hectic day. I too have posted morkuzhambu for the RCI event... looks good.lovelycolour and looks beautiful. 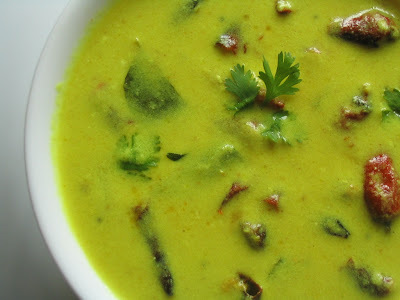 hey bharathy, your morkuzhambu looks delicious! It sure is a must try! the variation with vada balls must taste good as well. Thanks for the link! Also your pics look great! I also made MK today, with vendakkai. I think yours looks waaay better. Rightly said by Asha and Seema very similar to our majjige huli. whatever it is i love it! Thanx asha,I added the kannada name as well! Oh yeaaaah I agree with you my li'l sister!!! so u keeping ur legs in both boats, i see.. married a tamilian, i didn't know that! Nice mouthwatering pic of mor kulambu. all time favorite. Hey dear,Nice recipe this is different from Kerala Morucurry.We never put coriander in that...I will try this soon.Thanks . Bharathy.....hmm....Are u from Coimbatore? Oh....I wish I knew u already before I reached India this time...neways....ur startup is itself Amazing and wonderful recipes....Iam so happy to see fresh fruits n photos from my homeland again...great!! Kalakkunga!! Thank You for the excellent recipe , the flavor I had after cooking felt very authentic and not some fusion variation. Awesome, I tried this mor kuzambhu and it has come out very well. Ulli Thoran / Stir fried Onions with Coconut.